Should we restrict ‘opportunity hoarding’ by high-income families? In a previous post I wrote that “cognitive skills are very important in escaping poverty”. Looking at the other end of the wealth spectrum, it’s clear that family income is also very important in avoiding poverty. 74% of rich, low-skills kids escape poverty. Here’s the same chart used in my previous post, but this time I’m looking at the orange bar on the far right. It shows that 74% of children with the lowest cognitive skills who grew up in the highest income quintile manage to avoid a life of poverty in adulthood. But most of these children do slip into a lower income level, with only 4% managing to stay in the highest income group when they become adults. A college degree helps create a “glass floor” for high-income children. The authors of the study described this resistance to falling very steeply down the income scale as a “glass floor”. There is at least one factor that seems to be quite significant in helping these high-income adolescents of “modest skills” stay in the higher income groups. Getting a college degree is associated with a 23% greater chance of an adolescent of modest skills—i.e., predicted to fall—remaining in a higher-income household as an adult. Of course wealthier families are more able to afford for their children to complete college. Their outlays typically include not only tuition and other direct costs, but also expenses like tutors, high quality K-12 schools, freedom from having to work part-time, and extra-curricular activities that pave the way to a college degree. Non-monetary support in the form of encouragement and connections are also important. Is there a problem of “opportunity hoarding” at the top? And if so, should it be addressed? Committed parents work very hard to make sure their own kids do as well as possible. They invest time, love, money, and energy into their well-being and prospects. This is a natural, commendable instinct, one of the deepest instincts of any of us. Indeed, we want more parents to feel like this. Why shouldn’t they do everything they can to help their children do well, even if—perhaps especially if—they are somewhat dim? What’s the problem here, exactly? Of course advantage is passed down from one generation to the next in many ways that are benign, fair, and legitimate. Nobody is going to suggest affluent parents stop reading bedtime stories to their children in the interests of equal opportunity. But there may be some transmission mechanisms that are less legitimate. The use of social networks to close off certain areas of the labor market (e.g., the informal allocation of internships) could be seen as unfair hoarding of opportunities. Gaining preferential access to valuable education opportunities—for example, through legacy admissions—is another potential opportunity-hoarding mechanism. At the same time, the accumulation and transmission of financial wealth may also contribute to immobility at the top. Greater capital may, for example, ease transitions to higher education, or help with getting a foothold on the housing ladder in an area with good jobs. 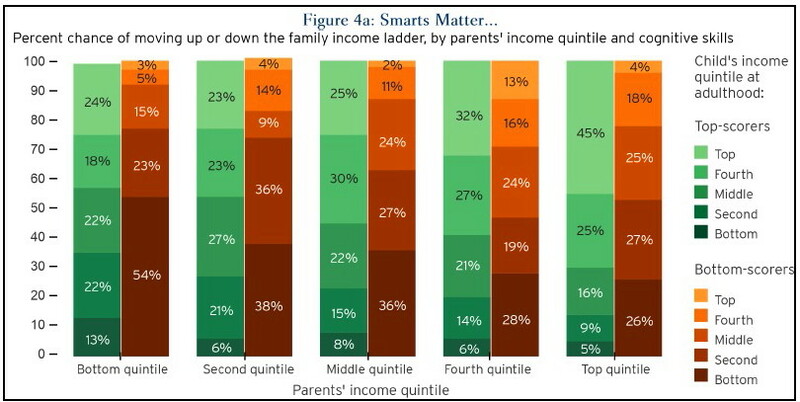 Here, then, is the problem: the laudable desire of parents to do the best for their own children translates into systematic opportunity hoarding at the top of the income distribution. There is a strong meritocratic argument that lower-skill rich children should not triumph over the highly-skilled poor, and take up disproportionate space at the top. It’s hard to find agreement on whether “hoarding” should be curtailed. One idea would be to focus greater resources in providing support for the “poor smart kids” to attend colleges commensurate with their achievement levels. Posted in preparing for college | Comments Off on Should we restrict ‘opportunity hoarding’ by high-income families?